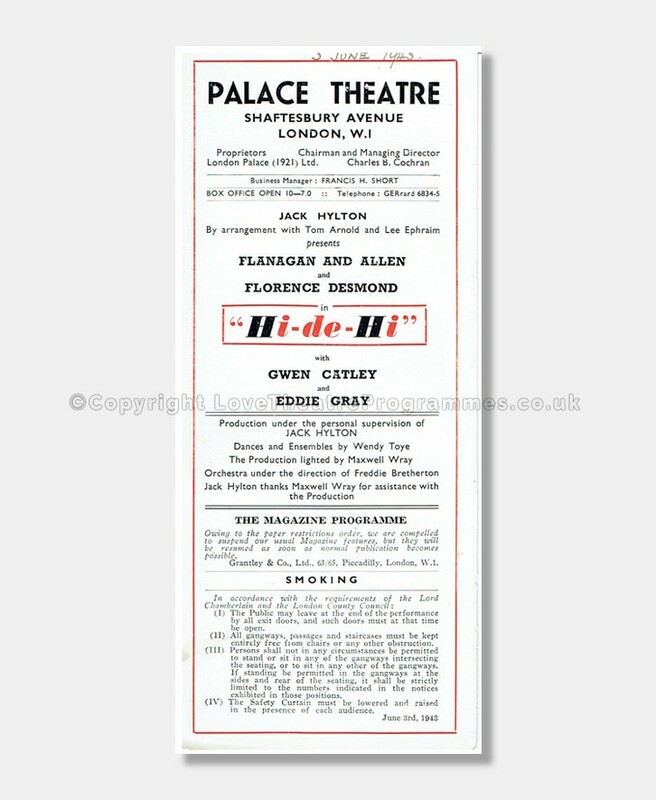 This substantial 1930s theatre programme is made of smooth white paper printed in black yellow and blue inks. 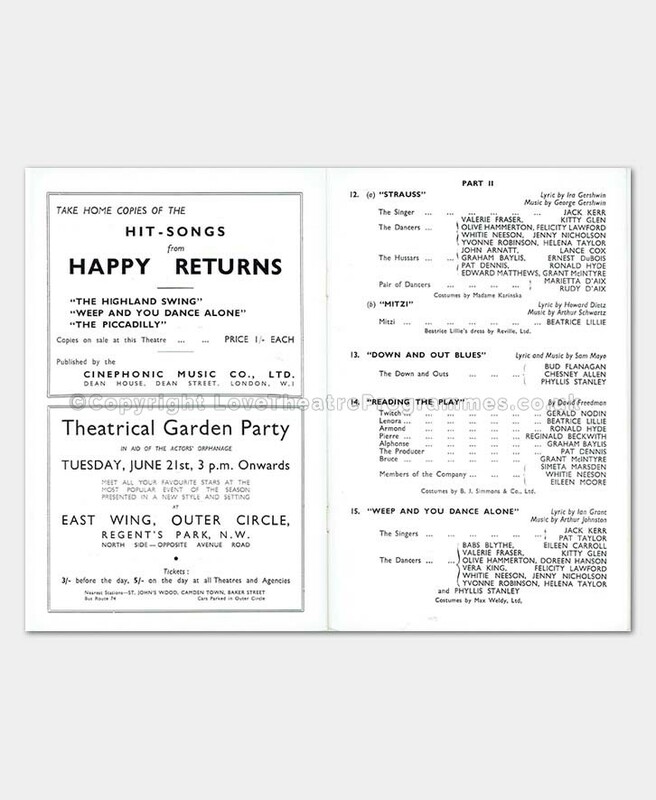 The programme has wonderful black and white full page photos of the stage performers in this show. 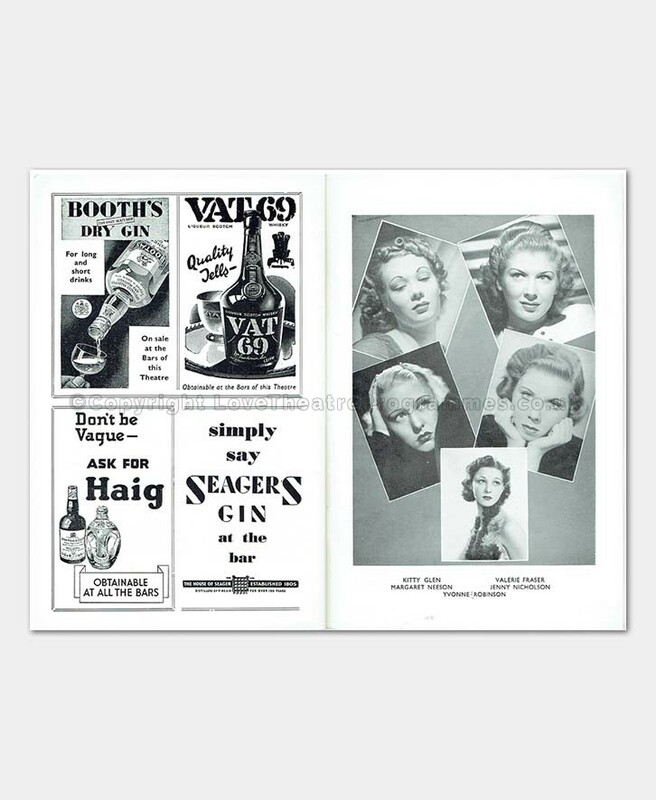 There are a variety of interesting advertisements accompanied with illustrations and detailed photos within the programmes pages, such as Booths Dry Gin and Elizabeth Arden Lipsticks. The seal sticker remains on page 3 and last cover page. The show is a variety performance of singers, actors and dancers. 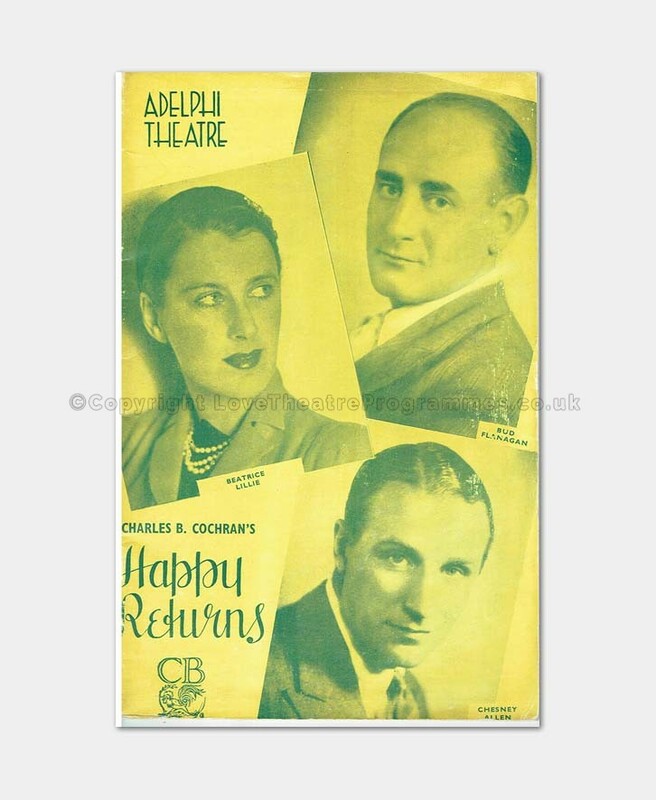 The cast list includes many successful performers of the time including Beatrice Lillie. Beatrice Lillie (1894 – 1989) was a popular singer comedian and actress. She started performing on the stage when she was a young girl and had a long acting career. 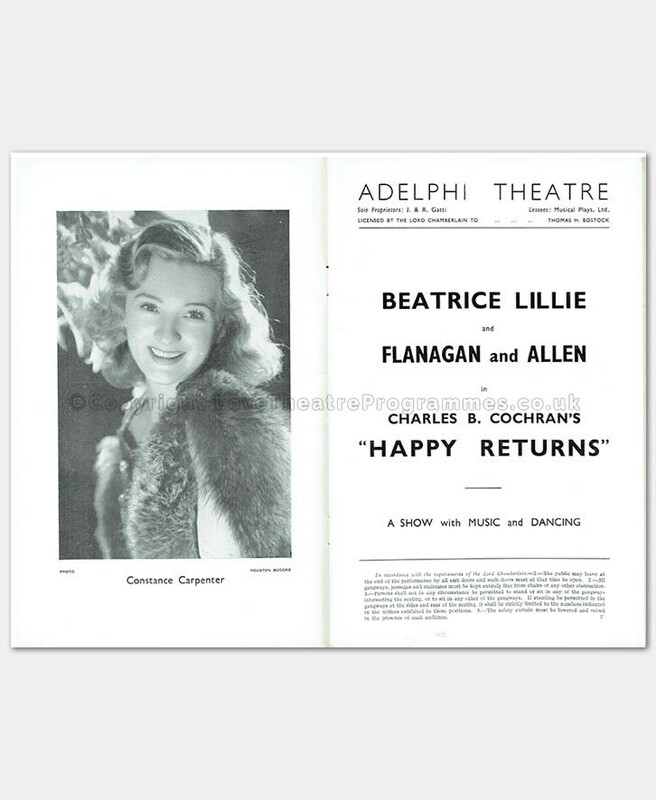 As well as being a stage actress she also appeared in films including Thoroughly Modern Millie in 1967. 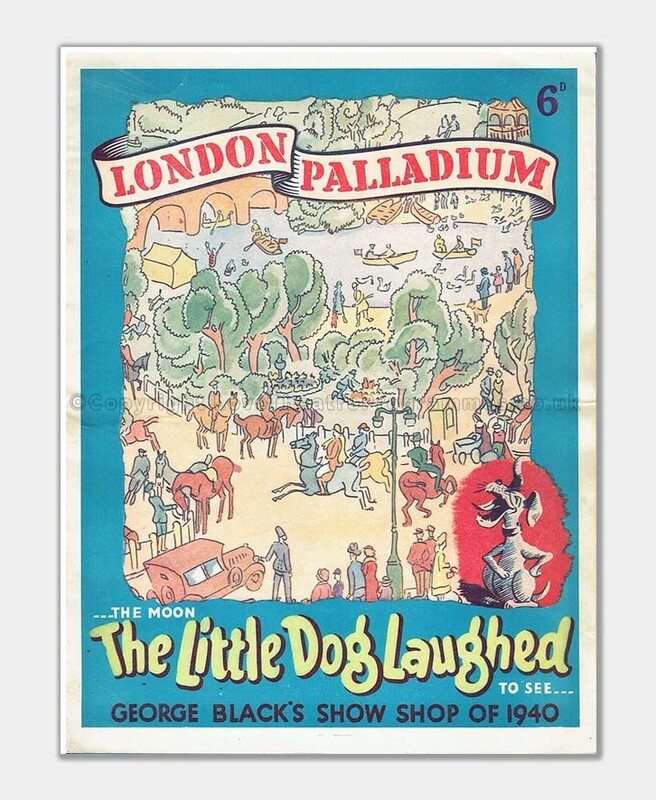 Also performing in the show is a very successful comic double act, Flanagan and Allen. 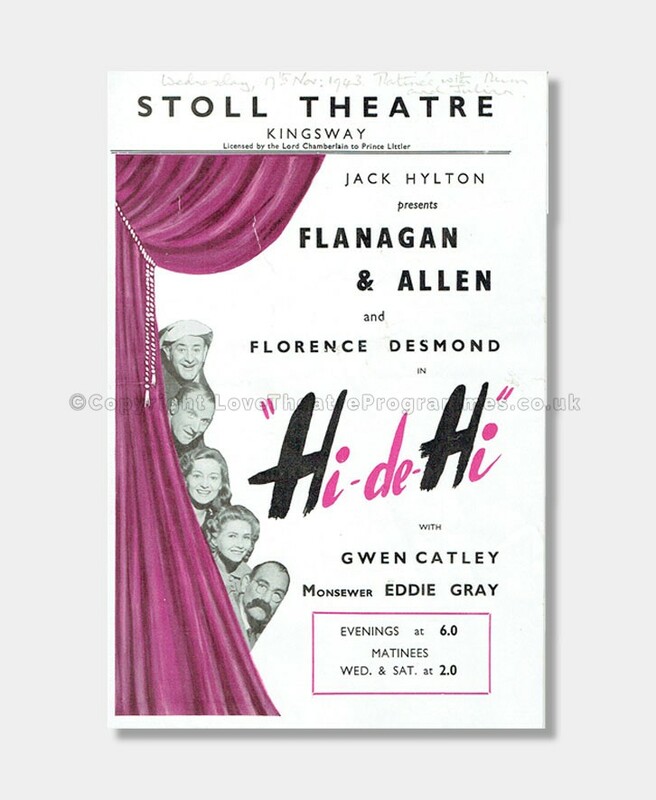 Bud Flanagan, was London born as Chaim Reuben Weintrop, (1896 – 1968). He became a famous comedian and had a successful career on both stage and screen. He was a very popular world-renown performer particularly remembered for entertaining the troops during WWII and keeping up moral. From a young adult, Bud Flanagan had the good fortune to travel and perform around the globe; in 1915 he enlisted into the during the First World War. During his time in the army he met a Sergeant-Major Flanagan who, by some accounts, inspired the stage name that Bud Flanagan adopted. Chesney Allen was the other half of Flanagan and Allen. 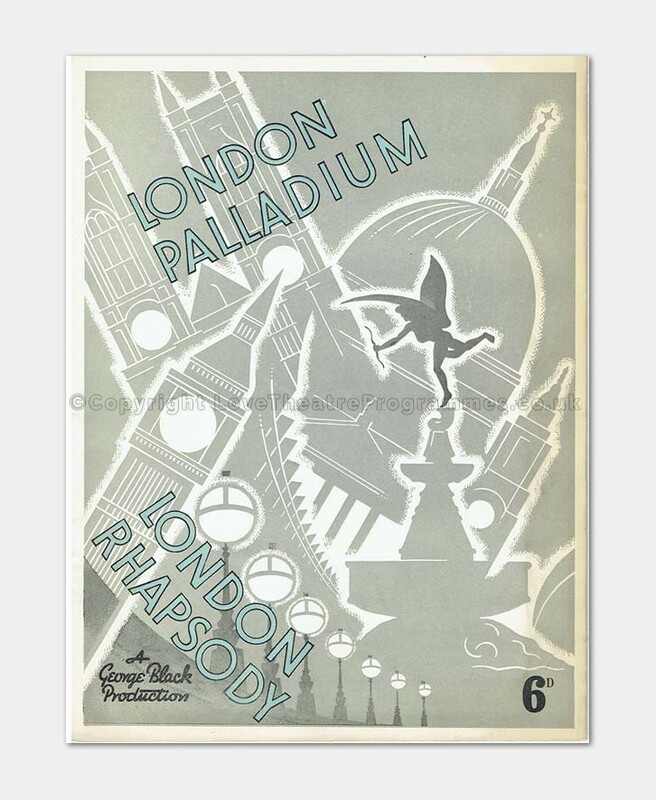 Chesney Allen (1894 – 1982) was born William Ernest Chesney Allen and was a popular English entertainer born in London, England. 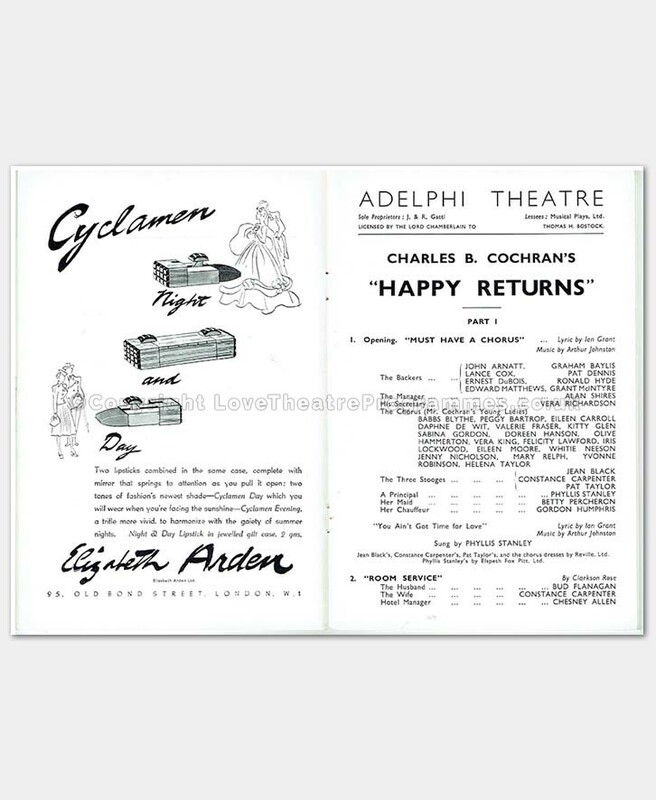 Chesney Allen first started acting on the stage as a serious actor in 1912. 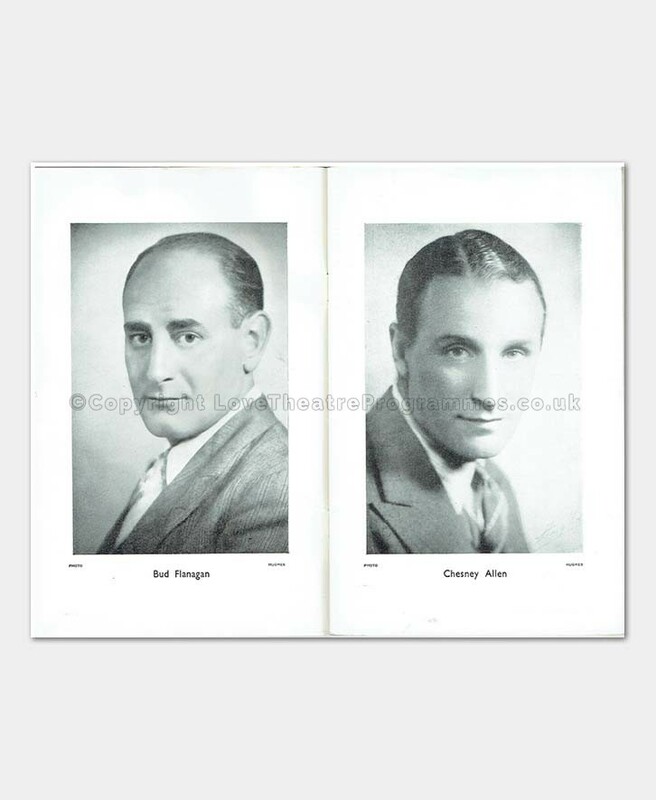 In the mid-1920s Chesney Allen having turned toward comedy, joined up with Bud Flanagan and created a successful double act. 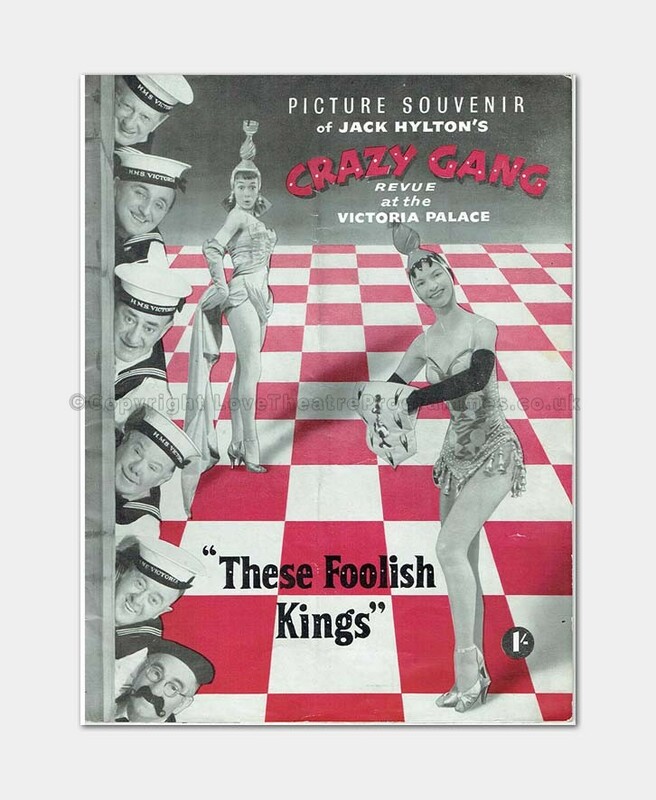 In the early 1930s Flanagan and Allen became a part of the very successful comedy-act troupe, which became known as ‘The Crazy Gang’. There are 36 pages including front and back cover pages. Approx. H21cm x W14cm. Condition Code: 4: Slight rusting to staples but pages firmly secured. No foxing or tears. 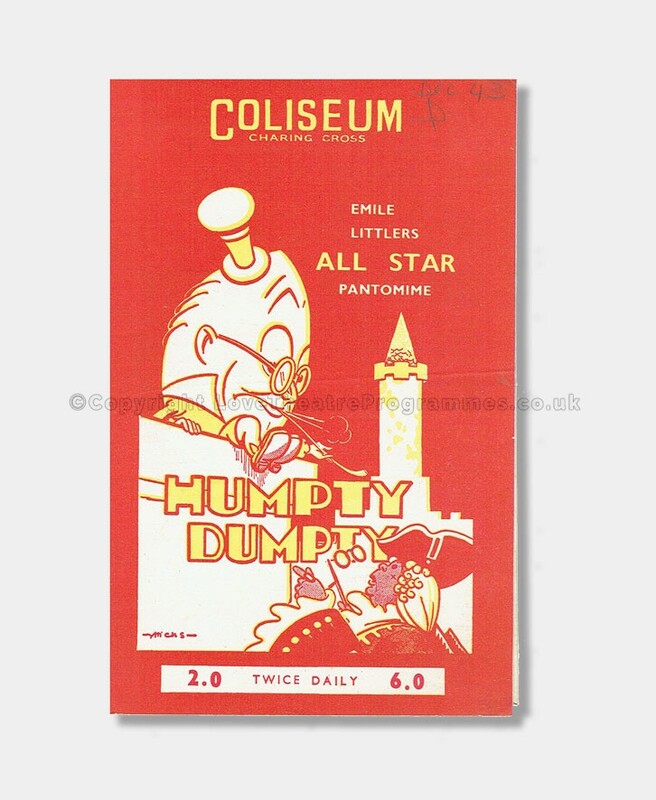 The programme is in great condition for its age. Main Actors: Jimmy Nervo & Teddy Knox, Charlie Naughton and Jimmy Gold. 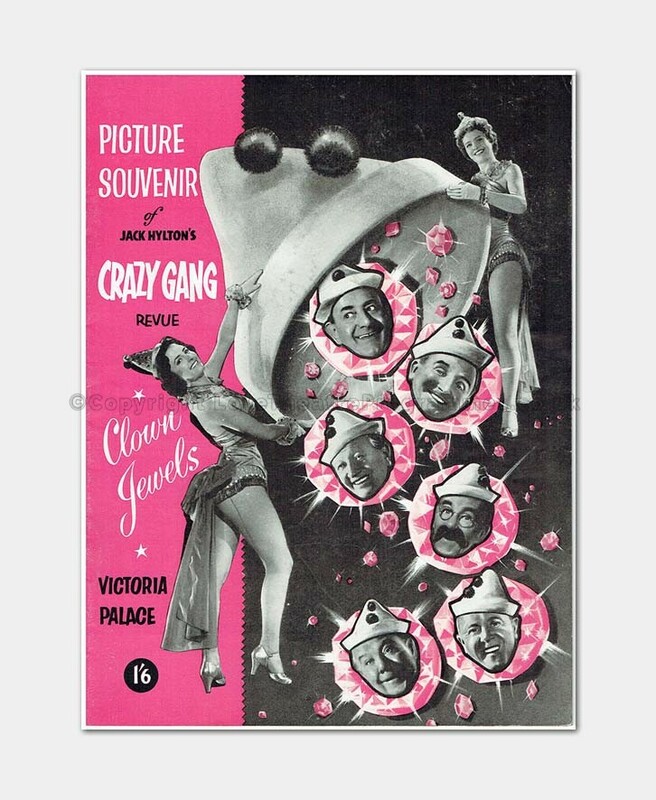 Main Actors: Jimmy Nervo & Teddy Knox, Bud Flanagan, Charlie Naughton & Jimmy Gold. Main Actors: Jimmy Nervo & Teddy Knox, Bud Flanagan & Chesney Allen, Charlie Naughton & Jimmy Gold. 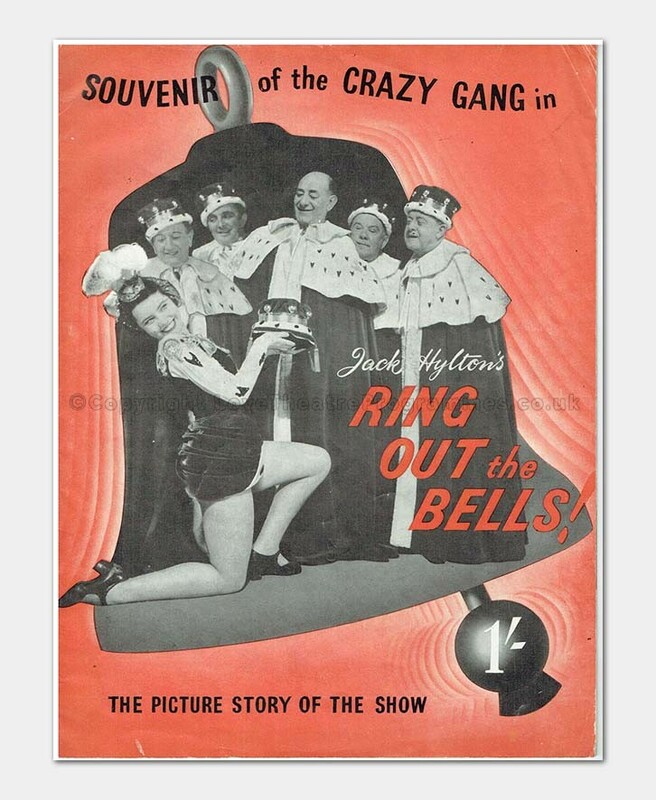 Main Actors: Bud Flanagan & Chesney Allen, Charlie Naughton & Jimmy Gold, Jimmy Nervo & Teddy Knox. Main Actors: Jimmy Nervo & Teddy Knox, Bud Flanagan & Chesney Allen, Charlie Naughton & JimmyGold. Main Actors: Bud Flanagan & Chesney Allen, Eddie Gray, Gwen Cateley, Florence Desmond.